4-Piston, Brembo GT Front Big Brake Kit for Subaru BRZ / Scion FR-S / Toyota GT86. Red / Silver / Black caliper colors available. 326x30mm (12.8") 1-Piece Slotted Disc. Stainless Steel Brake Lines included. Kits are assembled upon order. Disclaimer: Purchasing this kit directly from us will ensure that your brake kit is packaged and designed specifically for your Subaru BRZ / Scion FR-S / Toyota 86 / GT86. 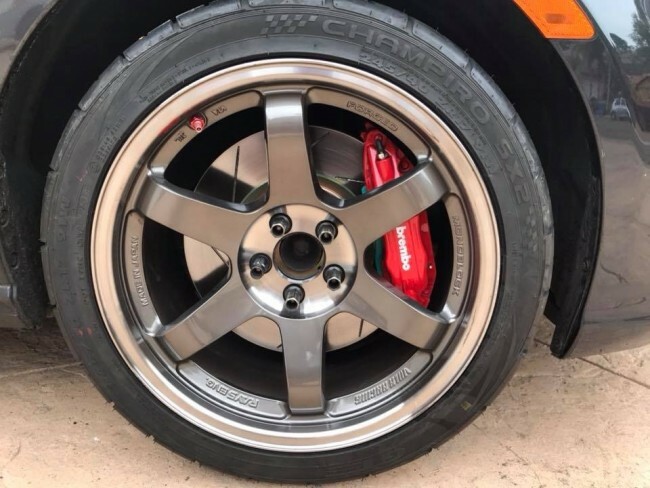 We cannot guarantee the performance of the Brembo GT kit nor be capable of supporting a variant of this Brembo GT BBK if it is not packaged for and by CSG. CounterSpace Garage (CSG) specializes in balanced setups of power, footwork, reliability, and driver feedback to develop a complete package to enhance the overall performance of vehicles. The elevation of each category requires a detailed look on what works and what does not work. This requires an enormous amount of effort for R&D, engineering, and testing. 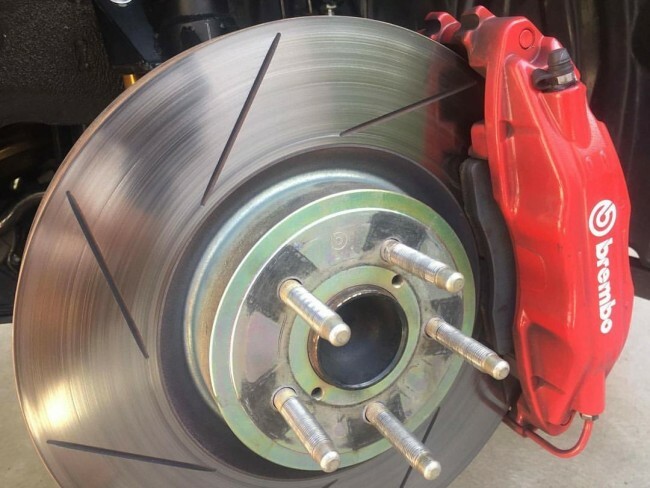 The Subaru BRZ / Scion FR-S / Toyota GT86 platform has excellent brakes from the factory and has a brake system dialed in better than most sports cars in the world. 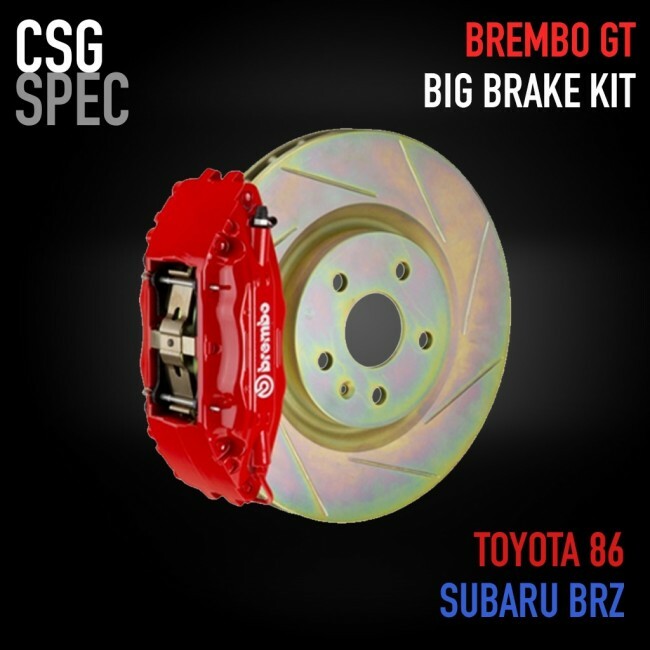 The latest project that CSG worked with Brembo is a big brake kit offering that satisfies and exceeds a variety of goals: performance, reliability, consistency, capacity, bias, comfort, and budget. 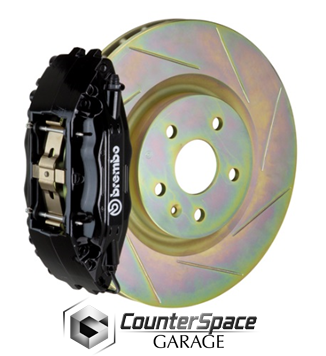 This big brake kit utilizes the Brembo GT 4-piston caliper, a true Brembo racing/street caliper that is found on racecars and supercars. The GT caliper is a more rigid and robust caliper that maintains excellent form under high stress and heat, yet has amenities to keep it comfortable for street use. The rotor is a 1-piece 326x30mm slotted zinc-plated disc. The disc offers excellent thermal capacity and cooling to keep the brakes consistent throughout use and is much more cost effective to purchase when it is time to replace. 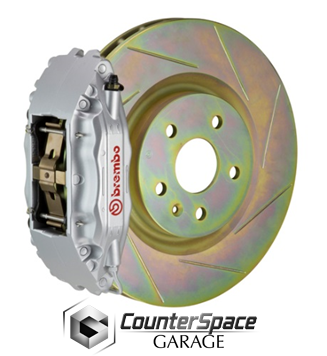 Finally, the brake kit comes with Brembo High Performance brake pads, which have been tested to be effective for track use and for the street.